Medical Tools Veterinary Otoscope has LED bright light. It lit the examination area with no reflections. A set of veterinary specula can reach deep while magnifying lens helps a detailed examination of the tympanic membrane. An Ophthalmoscope is used to examine the eye’s interior structure, including the retina. Ophthalmoscope combines a light source with built-in mirrors and lenses to examine the interior structures of the eye. 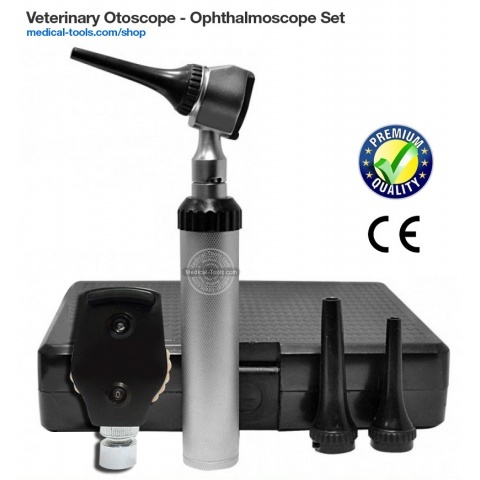 A Veterinary ENT set has an Otoscope, Ophthalmoscope, Nasal, Larynx exam instruments.